Description Heated Leather Seats, Sunroof, 3rd Row Seat, Navigation, 4x4, SAFETY & CONVENIENCE PACKAGE, 2ND ROW CAPTAINS SEATS, Trailer Hitch, Captains Chairs, Alloy Wheels. SHORELINE BLUE PEARL exterior and GRAPHITE interior, Limited trim. SEE MORE! 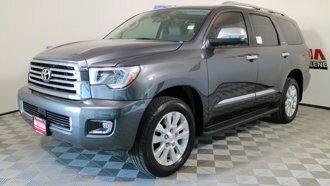 Leather Seats, Third Row Seat, Sunroof, 4x4, Power Liftgate, Rear Air, Heated Driver Seat, Back-Up Camera, Running Boards, Trailer Hitch, Aluminum Wheels, Dual Zone A/C, Cross-Traffic Alert, Blind Spot Monitor, Brake Actuated Limited Slip Differential. Rear Spoiler, Keyless Entry, Remote Trunk Release, Privacy Glass, Child Safety Locks. SAFETY & CONVENIENCE PACKAGE outside mirror memory, Radio: Premium Display Audio w/Nav/Entune/JBL, amplifier, AM/FM CD Player w/MP3/WMA playback capability, touch-screen display, auxiliary jack, USB 2.0 port w/increased charging capability and iPod connectivity and control, hands-free phone capability, phone book access and music streaming via Bluetooth wireless technology, and voice recognition (integrated backup camera vehicle dependent), The Entune App Suite includes Bing, iHeartRadio, MovieTickets.com, OpenTable, Pandora, Yelp and Facebook Places (on CY13 audio only); real-time info including traffic, weather, fuel prices, sports and stocks, Two-Position Power Memory Driver's Seat, 2ND ROW CAPTAINS SEATS 7 passenger.